Shoe Recycling Fundraiser changes the world one pair of shoes at a time. We are a social enterprise with a triple bottom line. Our goal is to earn a living while working to protect the environment, support sustainable development in Africa, and provide dignified employment at home to individuals with disabilities. We pride ourselves on integrity, responsiveness, and attention to detail. Underlying all is our recognition that our success depends on our partners’ success and satisfaction with the Shoe Recycling Fundraiser model. You are our partner. Our goal is to make your fundraising efforts successful in every way: from the initial contact for information on how to start your fundraiser to simple cost free shipping solutions, and prompt payment for the shoes you collect, SRF takes pride in superior customer service. Our commitment is your complete satisfaction. 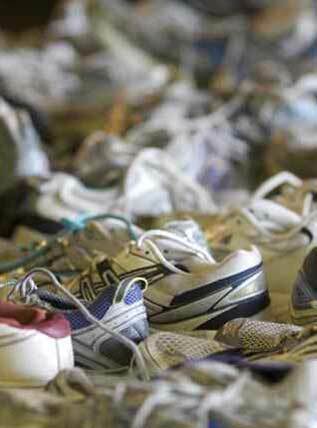 Shoe Recycling Fundraiser offers over two decades of expertise recycling shoes for re-use. We understand shoe recycling and fundraising, and know how to make each rewarding for your organization. We support you with all the resources you need to make money recycling shoes, from educational flyers to simple and cost free shipping solutions. Shoe Recycling Fundraiser applies its 20 years of recycling expertise to making sure you succeed. You collect the shoes. Shoe Recycling Fundraiser pays you. The more shoes you collect, the greater the benefits to you and the planet – fewer shoes wasted in landfills, more entrepreneurs employed in Africa. The shoes you collect help provide a living wage in some of the most impoverished regions of Africa where both employment and affordable footwear are in short supply. that transform unwanted yet perfectly useful footwear into a force for good! Collect footwear. Raise money. Protect the planet.